Adrian, Tuesday Toilers, the Committee, and interested friends, are invited to meet at Julian's Kitchen, which is on the corner of Through Road and Riversdale Road, at 12 noon to celebrate another successful year in South Surrey Park. This is a change from the previously advertised venue, Cafe Biscotti. As we have come to the end of the planting season this Sunday will be a "seek and destroy" day and we will be targeting weeds. Meet at the Information Board near the big bridge wearing suitable clothes for being around plants and to cope with whatever weather comes up! We will stop work at around twelve noon and enjoy a chat and morning tea together. 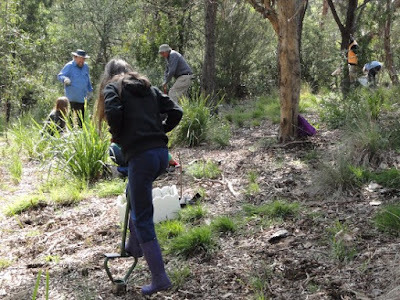 We had a great day with fourteen people enthusiastically planting at Peter Tucker's direction in the area beside the path from Union Road. It was good to see Gordana McHugh at her second working bee. We hope she enjoys coming for many more. Peter talking about the plants and how we go about the working bee. Chloe Campbell has been coming since she was a baby and now she is able to use the Hamilton planter. Here she is at work. One last photo of Peter with Gordana and Fran, our newest members. Today we planted many native grasses and herbs near Delta Street, "infilling" areas that have been previously planted. The plants were then watered in and we had our tea, coffee, cake and biscuits. 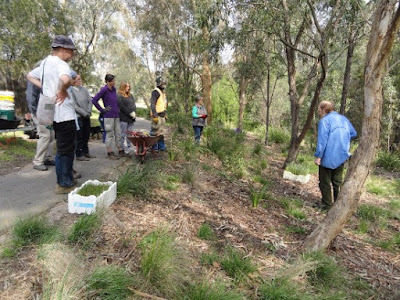 For our first weekend bee in 2015, we spread mulch next to the path that runs between the Riversdale Road shops and the big bridge to prepare this area for later planting. There was a good turnout despite some passing showers. 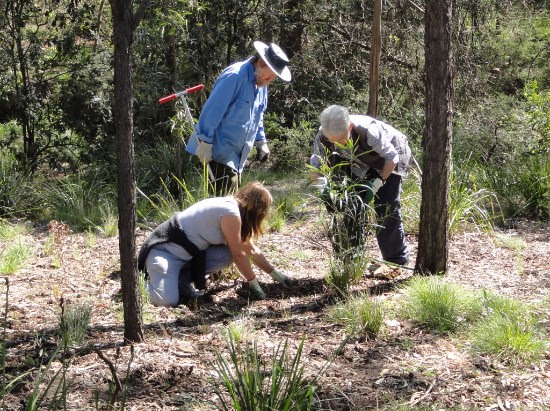 The next Sunday working bee is 31 May.